Surprise your kids by making these Healthy Breakfast Sundaes this summer! Made healthy with all the ingredients you want your kids to eat, but in a fun and delicious way. We also eat these for dessert! Yogurt sundaes are my favorite dessert — and when I say yogurt sunday, I take plain yogurt, and turn it into a “sundae” by adding yummy toppings. I take frozen bananas, mix them with plain yogurt, and then top with berries, chocolate chips, and nut butter. Since starting to make this Toasted Coconut Granola a few months ago, that gets sprinkled on top, too. (Granola really is dessert- just as much sugar as any of the cookies or desserts I make!). We’ve been buying tons of fresh berries. I am in heaven getting them while I am home in Oregon. I buy berries thinking of all the recipes I could make and how pretty they’d look in the photographs, but then the berries are gone before I get to recipe development. One thing they’ve been making it into is our “frozen yogurt.” I’ve been making nice cream in my Vitamix with frozen bananas, greek yogurt, and berries. Strawberries, blueberries and raspberries all work. Blackberries would be incredible- I can’t wait for that season! While we eat that frozen yogurt for dessert, I was thinking the other day about how fun it would be to turn it into a sundae and serve it to kids for breakfast. After making these, I knew this would become a family tradition for us. Xander won’t remember eating these (he’s not yet 2! ), so I am going to reserve this very special presentation for his birthdays. What kid wouldn’t love an ice cream sundae for breakfast on his birthday? 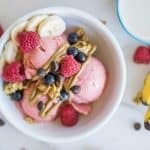 I’ve made these Healthy Breakfast Sundaes with raspberries, blueberries and strawberries, and all are delicious! Later in the summer I will also try peaches and blackberries! If you don’t have berries, just straight banana is always delicious — or ooh, add some cocoa powder and make chocolate ice cream! The possibilities are endless. 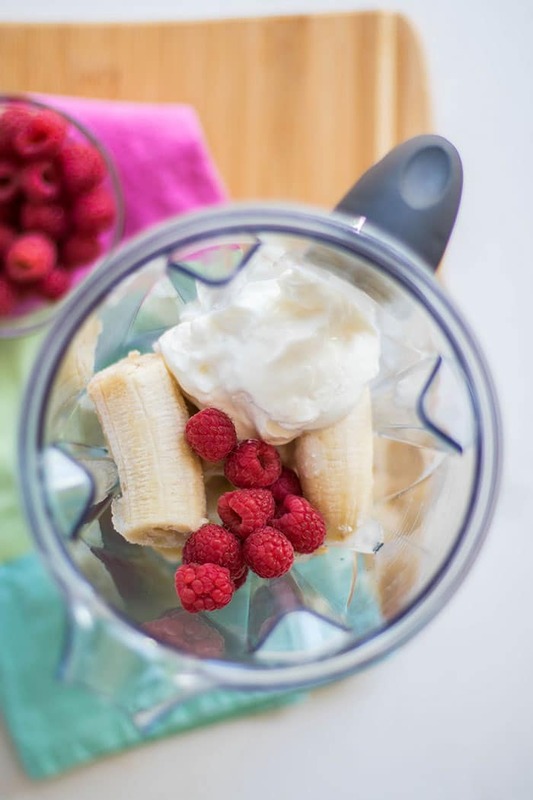 We usually just eat the ice cream out of the blender (use a high speed blender, like a Vitamix, for best results– do you know you can by refurbished Vitamix Blenders with a great guarantee for a lower price?!). (or food processor) – so it’s like soft serve. To scoop as photographed, add to a container, and freeze for 1-3 hours before scooping (any longer and it will be too hard to scoop out – this is not an ice cream recipe that can be frozen and eaten the next day). Make it Vegan or Dairy Free: Sub coconut milk for the yogurt, or try using a vegan almond milk or coconut yogurt. I use full fat coconut milk often and it adds more sweetness! Make it Paleo: Just skip the granola! 1/2 cup greek yogurt full fat is the best! nut butter I used unsweetened sunflower butter - my fav! Freeze bananas until very frozen (overnight is best). Make sure to cut them in quarters so they will blend or process easily. 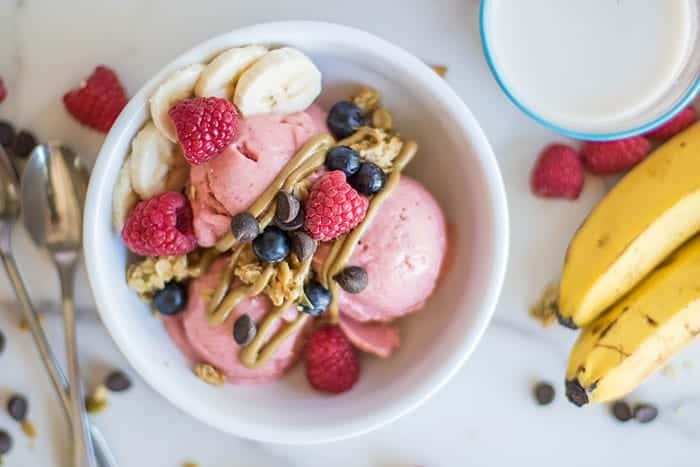 Add yogurt, fresh (or thawed from frozen) berries and frozen bananas to a high speed blender or into a food processor bowl. Process until all combined and the consistency is soft and fluffy like soft serve. If you want scoopable ice cream, add to a freezer container, and freeze for 1-3 hours. I put it in our deep freeze for a little over an hour and it was a great consistency. Otherwise, just eat it like soft serve! Top with granola, nut butter, and fresh fruit! Customize with whatever toppings you like! You can also use a different berry, peaches, or mango in this recipe. If using peaches or mango, freeze those along with the bananas. That sunflower butter looks marvelous on the ice cream! Sounds like a great way to balance out the sweet! This totally looks like an ice cream sundae! I know it would definitely get the kids to the table in the morning! What a great surprise for kids this would be! Can only imagine how happy they'll be to be offered such deliciousness for breakfast or as dessert! 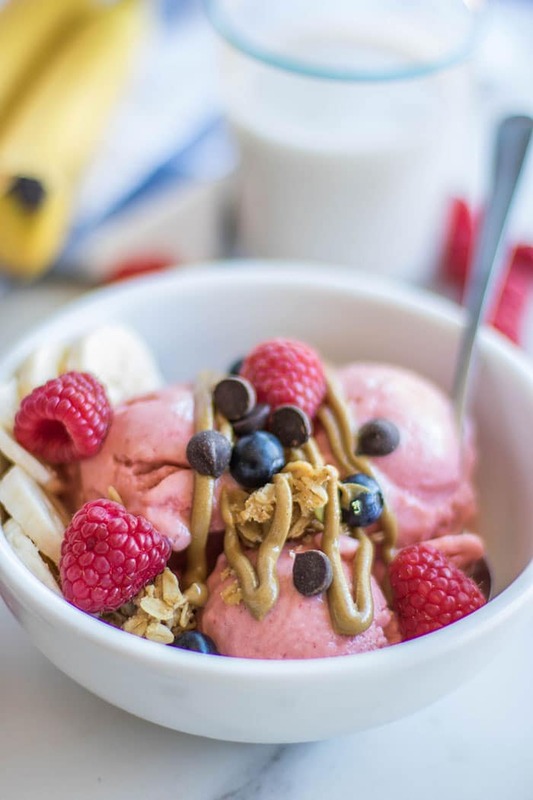 Oh I so love the idea of Healthy Breakfast Sundaes!! Yes I am sure not just kids but adults will love it too. This adult loves them too! Oh wow, can't believe these are healthy, they look so wicked! 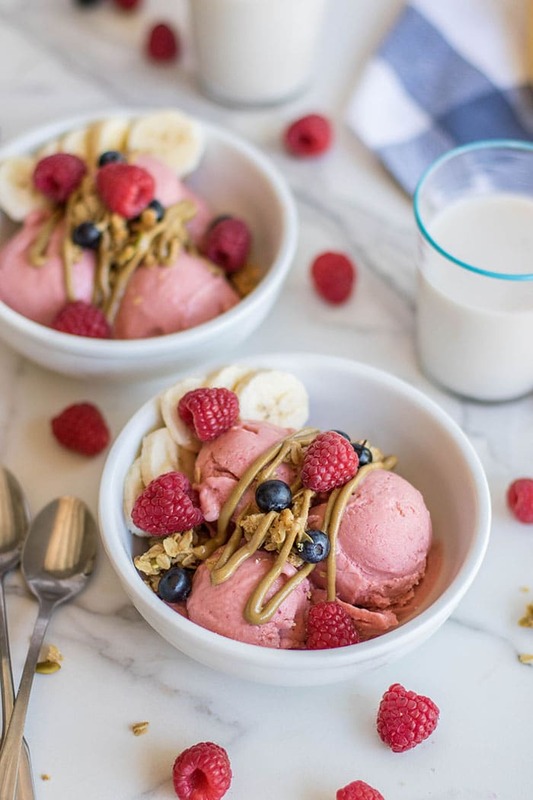 These sundaes look so healthy and good for you too! Easy to fool the kids that they are super naughty! Oh wow! This looks delicious, and I love that I have everything I need to make this in my fridge right now. This will be going down in my kitchen this week! Yay! I hope you enjoy it Mandee. My 2 year old now points to the Vitamix and asks for ice cream in the mornings :) I'm happy to oblige! A sundae for breakfast. I am all in. And it is good for me. Exactly! Anytime breakfast resembles dessert I am happy. Hey, this looks great! I definitely need to try this kind of healthy breakfast. Never ate it before to be honest. I love eating nicecream for breakfast! Great idea to dress it up with granola and make such a fun summer meal for the kiddos :) I don't eat dairy so I use full-fat coconut milk instead and it works perfectly! 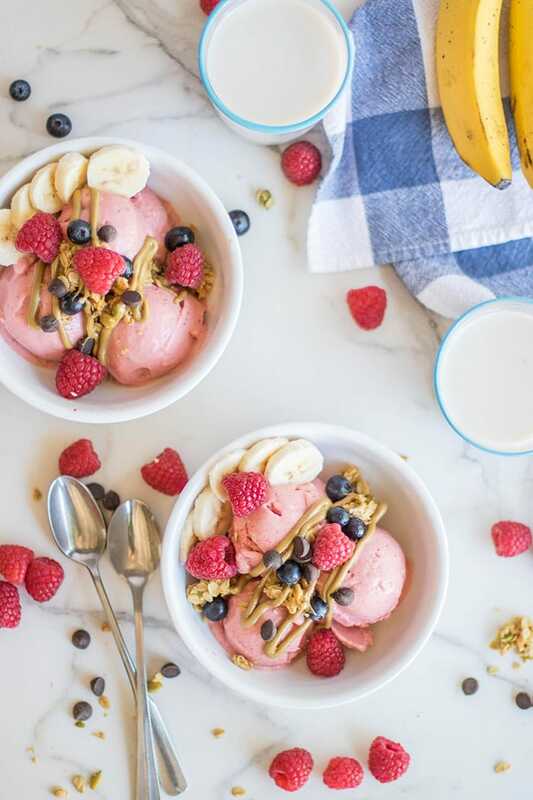 I am all about the coconut milk :) That's what I typically use in nice cream-- I added greek yogurt to this breakfast version to give it a bit of protein.